Calendar of Treasury Books, Volume 8, 1685-1689. Originally published by His Majesty's Stationery Office, London, 1923. Henry Guy to the Customs Commissioners to deliver to the Marquis de Torcy, Envoy Extraordinary from the French King, his goods as follow "in such manner as has been done to other Envoys or Ambassadors in like cases"; and further to immediately deliver to him the portmantle which was stopped at Canterbury. Out Letters (General) XI, p. 168. Appending: request, dated London, Aug. 11–1 last, from said Marquis, requesting delivery of the baggage of him and his suite. William Blathwayt to Col. Stede [Lieutenant Governor of Barbados]. Yours of April 14 last to hand. As to the 800l. 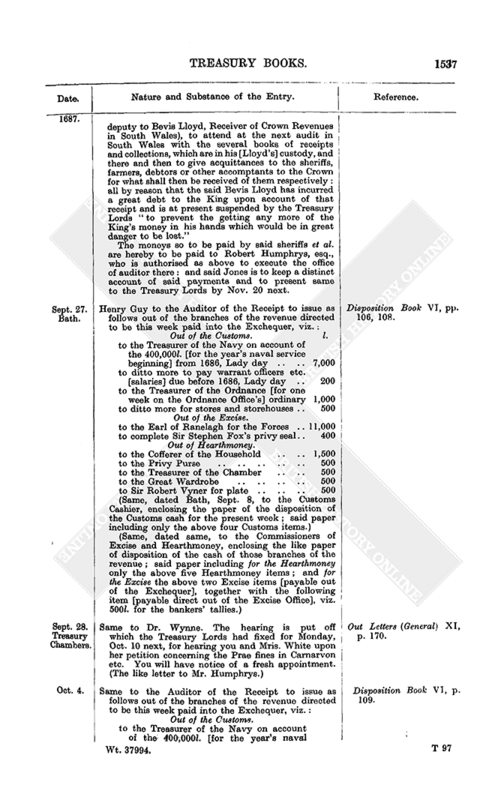 remaining in your hands due to the King on Mr. Hanson's account, the Treasury Lords direct you to forthwith remit same to Henry Guy by bills of exchange at price current. Out Letters (Plantations Auditor) I, p. 242. Henry Guy to the Attorney General, together with the Solicitor General and other the King's Counsel, to adjust with persons nominated by the Queen Dowager her right and title to the houses near the Horse Guards, where the Countess Marischal and Mr. Blathwayte now live, viz. whether same are granted to her with the manor of Westminster or not "according to his Majesty's order at the Treasury (the Earl of Feversham, Visct. Preston and yourself being present) before the late assignment passed." Out Letters (General) XI, p. 170. Same to the Auditor of the Receipt to issue as follows out of the branches of the revenue directed to be this week paid into the Exchequer, viz. : Disposition Book VI, p. 104. [Out of the Customs.] l.
Treasury allowance of the last June 24 quarter's salary bill of the Hearthmoney Office: the details being ut supra, p. 1180 (total, 567l. 10s. 0d.). Money Book VIII, p. 248. Same, dated at Bath, of the incidents bill, detailed, of the Hearthmoney Office for the half year to June 25 (24) last (total, 547l. 18s. 5d. 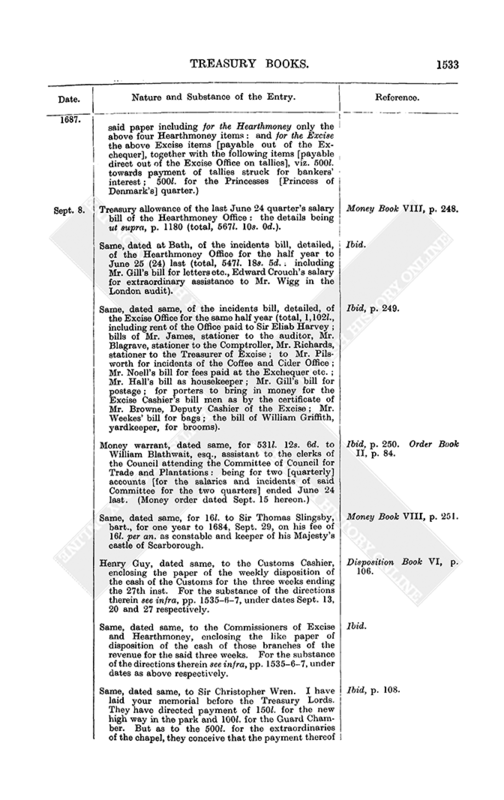 including Mr. Gill's bill for letters etc., Edward Crouch's salary for extraordinary assistance to Mr. Wigg in the London audit). Ibid. 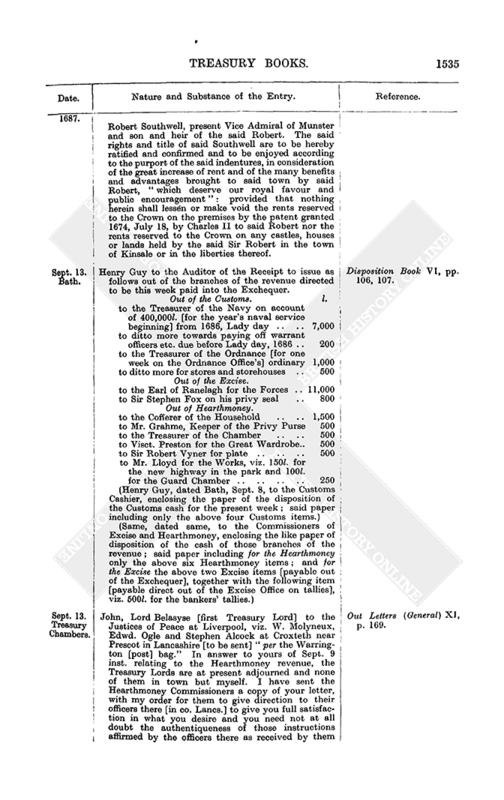 Same, dated same, of the incidents bill, detailed, of the Excise Office for the same half year (total, 1,102l., including rent of the Office paid to Sir Eliab Harvey; bills of Mr. James, stationer to the auditor, Mr. Blagrave, stationer to the Comptroller, Mr. Richards, stationer to the Treasurer of Excise; to Mr. Pilsworth for incidents of the Coffee and Cider Office; Mr. Noell's bill for fees paid at the Exchequer etc. 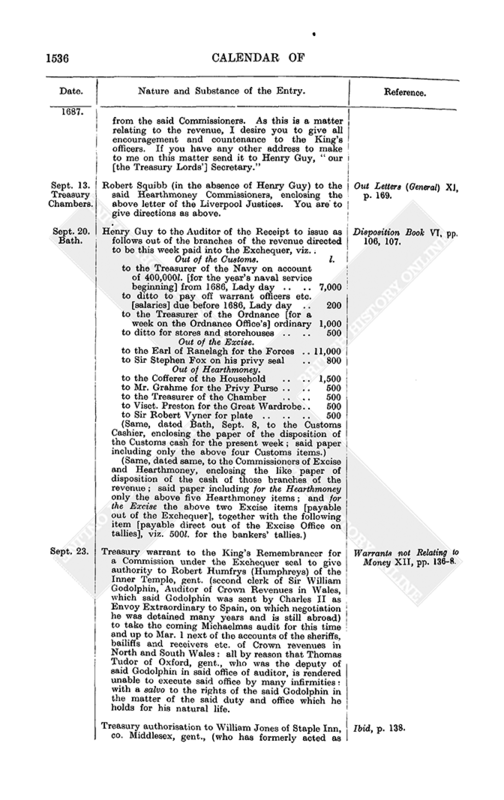 ; Mr. Hall's bill as housekeeper; Mr. Gill's bill for postage; for porters to bring in money for the Excise Cashier's bill men as by the certificate of Mr. Browne, Deputy Cashier of the Excise; Mr. Weekes' bill for bags; the bill of William Griffith, yardkeeper, for brooms). Ibid, p. 249. Money warrant, dated same, for 531l. 12s. 6d. to William Blathwait, esq., assistant to the clerks of the Council attending the Committee of Council for Trade and Plantations: being for two [quarterly] accounts [for the salaries and incidents of said Committee for the two quarters] ended June 24 last. (Money order dated Sept. 15 hereon.) Ibid, p. 250. Order Book II, p. 84. Same, dated same, for 16l. to Sir Thomas Slingsby, bart., for one year to 1684, Sept. 29, on his fee of 16l. per an. as constable and keeper of his Majesty's castle of Scarborough. Money Book VIII, p. 251. Henry Guy, dated same, to the Customs Cashier, enclosing the paper of the weekly disposition of the cash of the Customs for the three weeks ending the 27th inst. For the substance of the directions therein see infra, pp. 1535–6–7, under dates Sept. 13, 20 and 27 respectively. Disposition Book VI, p. 106. Same, dated same, to the Commissioners of Excise and Hearthmoney, enclosing the like paper of disposition of the cash of those branches of the revenue for the said three weeks. for the substance of the directions therein see infra, pp. 1535–6–7, under dates as above respectively. Ibid. Same, dated same, to Sir Christopher Wren. I have laid your memorial before the Treasury Lords. They have directed payment of 150l. for the new high way in the park and 100l. for the Guard Chamber. But as to the 500l. for the extraordinaries of the chapel, they conceive that the payment thereof may be allotted timely enough by the end of this month "because your memorial says it is for this month of September." Ibid, p. 108. Henry Guy, dated at Bath, to Mr. Hoare to furnish James Graham, esq., Keeper of the Privy Purse, with 3,000 Healing medals. The Treasury Lords will take care for the payment for same. Disposition Book VI, p. 108. Same to the Customs Commissioners to report on the enclosed information [missing] of Henry Allen, who will attend you therein. Out Letters (General) XI, p. 169. Out Letters (Customs) XI, p. 68. Given at our Court at Bath. Royal sign manual for 1,000l. to Sir Richard White, bart., as royal bounty, without account: to be issued on the 20,000l. privy seal dormant of July 28 last and to be issued out of moneys (now in the Exchequer) of the wreck which was taken out of the sea near Hispaniola. (Money warrant dated Sept. 12 hereon. Money order dated Sept. 12 hereon.) King's Warrant Book XII, p. 266. Money Book VIII, p. 251. Order Book II, p. 85. Royal warrant to the Lord Deputy of Ireland to remit 155l. 6s. 6d. to Visct. Preston, Master of the Great Wardrobe, England, for coats by him furnished and sent over to Ireland for the officers there as follows, viz. one rich coat for Ulster King at Arms at 90l. 12s. 6d. ; one coat for Athlone Pursuivant at Arms at 29l. 12s. 0d. and three coats for three messengers at 11l. 14s. 0d. each, which expense the King has resolved shall be met out of the revenue of Ireland. Out Letters (Ireland) V, pp. 48–9. 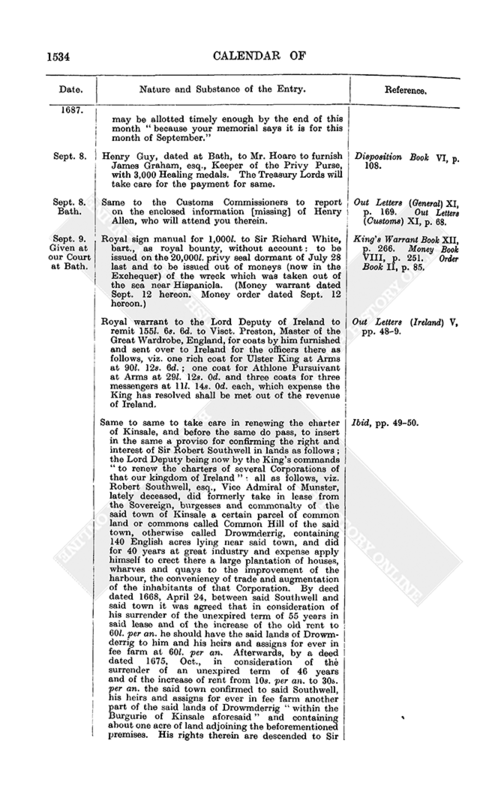 Same to same to take care in renewing the charter of Kinsale, and before the same do pass, to insert in the same a proviso for confirming the right and interest of Sir Robert Southwell in lands as follows; the Lord Deputy being now by the King's commands "to renew the charters of several Corporations of that our kingdom of Ireland" all as follows, viz. Robert Southwell, esq., Vice Admiral of Munster, lately deceased, did formerly take in lease from the Sovereign, burgesses and commonalty of the said town of Kinsale a certain parcel of common land or commons called Common Hill of the said town, otherwise called Drowmderrig, containing 140 English acres lying near said town, and did for 40 years at great industry and expense apply himself to erect there a large plantation of houses, wharves and quays to the improvement of the harbour, the conveniency of trade and augmentation of the inhabitants of that Corporation. By deed dated 1668, April 24, between said Southwell and said town it was agreed that in consideration of his surrender of the unexpired term of 55 years in said lease and of the increase of the old rent to 60l. per an. he should have the said lands of Drowmderrig to him and his heirs and assigns for ever in fee farm at 60l. per an. Afterwards, by a deed dated 1675, Oct., in consideration of the surrender of an unexpired term of 46 years and of the increase of rent from 10s. per an. to 30s. per an. the said town confirmed to said Southwell, his heirs and assigns for ever in fee farm another part of the said lands of Drowmderrig "within the Burgurie of Kinsale aforesaid" and containing about one acre of land adjoining the beforementioned premises. His rights therein are descended to Sir Robert Southwell, present Vice Admiral of Munster and son and heir of the said Robert. 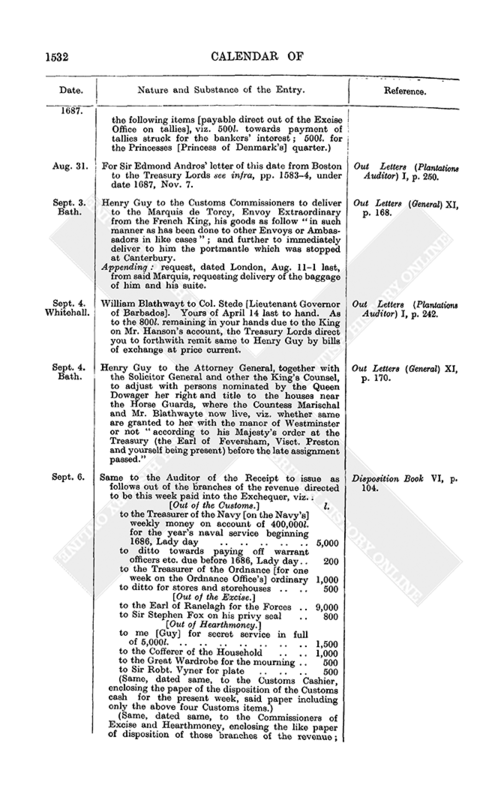 The said rights and title of said Southwell are to be hereby ratified and confirmed and to be enjoyed according to the purport of the said indentures, in consideration of the great increase of rent and of the many benefits and advantages brought to said town by said Robert, "which deserve our royal favour and public encouragement": provided that nothing herein shall lessen or make void the rents reserved to the Crown on the premises by the patent granted 1674, July 18, by Charles II to said Robert nor the rents reserved to the Crown on any castles, houses or lands held by the said Sir Robert in the town of Kinsale or in the liberties thereof. Ibid, pp. 49–50. Henry Guy to the Auditor of the Receipt to issue as follows out of the branches of the revenue directed to be this week paid into the Exchequer. Disposition Book VI, pp. 106, 107. Out of the Customs. l.
John, Lord Belasyse [first Treasury Lord] to the Justices of Peace at Liverpool, viz. W. Molyneux, Edwd. Ogle and Stephen Alcock at Croxteth near Prescot in Lancashire [to be sent] "per the Warrington [post] bag." In answer to yours of Sept. 9 inst. relating to the Hearthmoney revenue, the Treasury Lords are at present adjourned and none of them in town but myself. I have sent the Hearthmoney Commissioners a copy of your letter, with my order for them to give direction to their officers there [in co. Lancs.] to give you full satisfaction in what you desire and you need not at all doubt the authentiqueness of those instructions affirmed by the officers there as received by them from the said Commissioners. As this is a matter relating to the revenue, I desire you to give all encouragement and countenance to the King's officers. If you have any other address to make to me on this matter send it to Henry Guy, "our [the Treasury Lords'] Secretary." Out Letters (General) XI, p. 169. Robert Squibb (in the absence of Henry Guy) to the said Hearthmoney Commissioners, enclosing the above letter of the Liverpool Justices. You are to give directions as above. Out Letters (General) XI, p. 169. Henry Guy to the Auditor of the Receipt to issue as follows out of the branches of the revenue directed to be this week paid into the Exchequer, viz. Disposition Book VI, pp. 106, 107. Treasury warrant to the King's Remembrancer for a Commission under the Exchequer seal to give authority to Robert Humfrys (Humphreys) of the Inner Temple, gent. (second clerk of Sir William Godolphin, Auditor of Crown Revenues in Wales, which said Godolphin was sent by Charles II as Envoy Extraordinary to Spain, on which negotiation he was detained many years and is still abroad) to take the coming Michaelmas audit for this time and up to Mar. 1 next of the accounts of the sheriffs, bailiffs and receivers etc. of Crown revenues in North and South Wales: all by reason that Thomas Tudor of Oxford, gent., who was the deputy of said Godolphin in said office of auditor, is rendered unable to execute said office by many infirmities: with a salvo to the rights of the said Godolphin in the matter of the said duty and office which he holds for his natural life. Warrants not Relating to Money XII, pp. 136–8. Treasury authorisation to William Jones of Staple Inn, co. Middlesex, gent., (who has formerly acted as deputy to Bevis Lloyd, Receiver of Crown Revenues in South Wales), to attend at the next audit in South Wales with the several books of receipts and collections, which are in his [Lloyd's] custody, and there and then to give acquittances to the sheriffs, farmers, debtors or other accomptants to the Crown for what shall then be received of them respectively: all by reason that the said Bevis Lloyd has incurred a great debt to the King upon account of that receipt and is at present suspended by the Treasury Lords "to prevent the getting any more of the King's money in his hands which would be in great danger to be lost." Ibid, p. 138. The moneys so to be paid by said sheriffs et al. are hereby to be paid to Robert Humphrys, esq., who is authorised as above to execute the office of auditor there: and said Jones is to keep a distinct account of said payments and to present same to the Treasury Lords by Nov. 20 next. Henry Guy to the Auditor of the Receipt to issue as follows out of the branches of the revenue directed to be this week paid into the Exchequer, viz. : Disposition Book VI, pp. 106, 108. Same to Dr. Wynne. The hearing is put off which the Treasury Lords had fixed for Monday, Oct. 10 next, for hearing you and Mris. White upon her petition concerning the Prae fines in Carnarvon etc. You will have notice of a fresh appointment. (The like letter to Mr. Humphrys.) Out Letters (General) XI, p. 170.